i have one old vase.i dont know where it came from or the value of this vase.Can anyone tell me.i need to know. The shape of the seal is typically Japanese. BTW, Japan also uses Kanji (Chinese characters). With antiques it is sometimes difficult to tell what are, but, having lived in Japan I am pretty sure this is a Japanese motif. The glaze looks pretty new, and the white color is that of the 20th century. 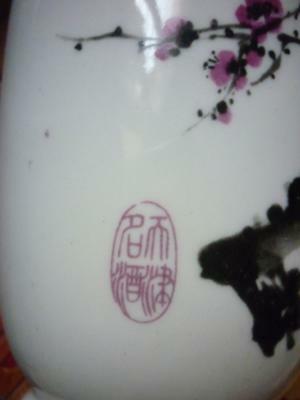 Such a snow white color is not possible in pre-20th century Chinese antiques. Therefore, it cannot be antique. 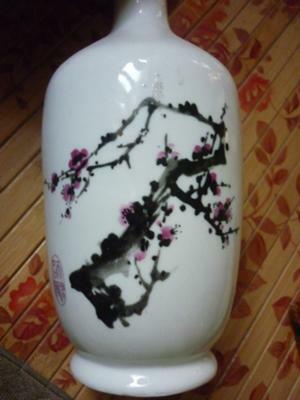 It was either made in Japan or if it was made in China, it is a copy of a Japanese motif. what do you mean by 'This hardly is Chinese. 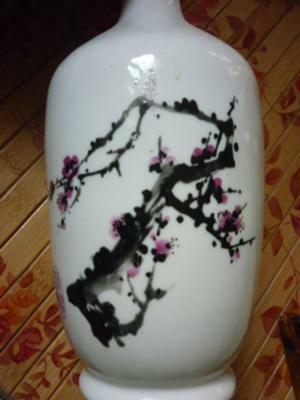 It looks like a modern Japanese vase'.i think the seal was ancient seal of Chinese.Can you tell me which dynasty this vase & how old this vase because i interested to buy. This hardly is Chinese. It looks like a modern Japanese vase.